Not to be confused with Deaf Smith County, Texas. 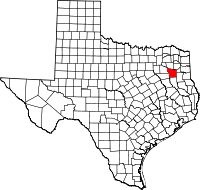 Smith County is a county in the U.S. state of Texas. As of the 2010 census, its population was 209,714. Its county seat is Tyler. Smith County is named for James Smith, a general during the Texas Revolution. Smith County is part of the Tyler metropolitan statistical area as well as the Tyler–Jacksonville combined statistical area. For thousands of years, indigenous peoples occupied this area of present-day Texas. The first known inhabitants of the area now known as Smith County were the Caddo Indians, who were recorded here until 1819. That year a band of Cherokee Indians, led by The Bowl (also known as Chief Bowels), migrated from Georgia and settled in what are now Smith and Rusk counties. The Treaty of Bowles Village on February 23, 1836, between the Republic of Texas and the Cherokee and twelve affiliated tribes, gave all of Smith and Cherokees counties as well as parts of western Rusk County, southern Gregg (formed from Rusk County in 1873) along with southeastern Van Zandt counties to the tribes. The Native Americans remained on these lands until the Cherokee War in the summer of 1839, as part of conflicts with Native Americans in Texas. The Cherokee were driven out of Smith County, as others of their kin were forced from the Southeast United States during Indian Removal. After 1845 some Cherokee returned when Benjamin Franklin Thompson, a white man married to a Cherokee, purchased 10,000 aces of land in Rusk County. The Mount Tabor Indian Community developed here, some six miles south of present-day Kilgore. The Community later grew and incorporated areas near Overton, Arp and Troup, Texas. In July 1846 Smith County separated from the Nacogdoches District and was named for James Smith, a General of the Texas Revolution. At this time Tyler was designated as the county seat. Camp Ford was the largest Confederate prisoner-of-war camp west of the Mississippi River during the American Civil War. Here Sheriff Jim Reed of Collin County and Judge McReynolds, former chief justice of the district, were seized and lynched by "Regulators." The original site of the Camp stockade is now a public historic park, owned by Smith County, and managed by the Smith County Historical Society. The park contains a kiosk, paved trail, interpretive signage, a cabin reconstruction, and a picnic area. It is located on Highway 271, 0.8 miles north of Loop 323. The Smith County Historical Society, a 501(c)(3) non-profit organization, was founded in 1959 by individuals and business firms dedicated to discovering, collecting and preserving data, records and other items relating to the history of Smith County, Texas. More information can be found at the Smith County Historical Society Website. According to the U.S. Census Bureau, the county has a total area of 950 square miles (2,500 km2), of which 921 square miles (2,390 km2) is land and 28 square miles (73 km2) (3.0%) is water. The county infrastructure includes some 1,180 miles (1,900 km) of two lane county road. As of the census of 2010, there were 209,714 people and 76,427 households residing in the county. The population density was 227.6 people per square mile (73/km²). There were 87,309 housing units. The racial makeup of the county was 70.1% White, 17.9% Black or African American, 0.5% American Indian and Alaska Native, 1.2% Asian, and 2.0% persons reporting two or more races. 17.2% of the population were Hispanic or Latino of any race. There were 76,427 households, out of which 34.8% had children under the age of 18 living with them, 51.8% were married couples living together, 13.3% had a female householder with no husband present, and 30.7% were non-families. 25.3% of all households were made up of a householder living alone. The average household size was 2.60 and the average family size was 3.13. The median income for a household in the county was $46,139. The per capita income for the county was $25,374. About 15.4% of families and 13.80% of the population were below the poverty line. In the county, the population was spread out with 26.60% under the age of 18, 9.80% from 18 to 24, 27.40% from 25 to 44, 22.10% from 45 to 64, and 14.10% who were 65 years of age or older. The median age was 36 years. For every 100 females there were 92.10 males. For every 100 females age 18 and over, there were 87.90 males. Conservative whites in Smith County began to ally with the Republican Party in 1964, making it one of three East Texas counties, along with Panola and Gregg, to vote for Barry Goldwater in 1964, when native son Democratic President Lyndon B. Johnson won re-election. At that time most blacks and Latinos in the county were still disenfranchised due to the state's discriminatory use of certain barriers. The last Democrat to carry Smith County was incumbent President Harry S. Truman in 1948. No Democrat has gained 30 percent of the county’s vote in the past five elections. The last Democrat to gain more than 40 percent was Jimmy Carter from Georgia in 1976. Smith County is represented in the Texas House of Representatives by Matt Schaefer (R) of Tyler and the Texas Senate by Senator Bryan Hughes (politician) (R). Its U.S. representative is Louie Gohmert (R). The county is governed by a Commissioners Court, made up of four members elected from single-member districts and a County Judge elected at-large. The county has been concerned about its roads since the early 21st century. It has some 1,180 miles (1,900 km) of two-lane county roads. 70% of these county roads were rated as "bad" or "poor" in 2004. The county Commissioners Court appointed a new county engineer in 2005 and initiated an aggressive reconstruction campaign. But after the election of 2006, the Commissioners Court cut back on the improvement campaign. During this period the county commissioners and judge passed what became a controversial pay increase for themselves, by a 3-2 vote. After heated protests from the public, they eventually scaled back the raises. New legislation was introduced at the state legislature to prohibit commissioners and county judges from authorizing raises for themselves during their first term of office. Smith County is part of the Tyler/Longview/Jacksonville DMA. Local media outlets are: KLTV, KTRE-TV, KYTX-TV, KFXK-TV, KCEB-TV, and KETK-TV. KTBB, an AM radio station based in Tyler, provides a news-talk format to the area. The daily Tyler Morning Telegraph is the primary newspaper in the county, based in Tyler. Coverage of the area can also be found in the Longview News-Journal, published in Longview, in Gregg County. ^ Clarke, Mary Whatley (1971). Chief Bowels and the Texas Cherokees: A History. p. 17. ^ Pynes, Patrick (2007). Historic Origins of the Mount Tabor Indian Community: Northern Arizona University. p. 74. ^ Texas State Historical Association Online. "Smith County". Texas State Historical Association. Retrieved 7 May 2012. ^ "To discover, collect and preserve the history of Smith County". Smith County Historical Society. Retrieved 2015-08-15. ^ Leip, David. "Dave Leip's Atlas of U.S. Presidential Elections". uselectionatlas.org. Retrieved 4 April 2018.